Horst Kohler, the UN special envoy for Western Sahara. 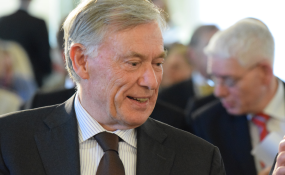 New York — Earlier today (January 29, 2019), the Personal Envoy of the UN Secretary-General for Western Sahara, Mr Horst Kӧhler, briefed the UN Security Council. Following his remarks, the Frente POLISARIO's UN Representative Dr Sidi Omar urged Council members to support rapid, concrete progress on the political track towards direct negotiations between the two parties. "The first round of peace talks on Western Sahara made it clear that the status quo is unsustainable - and an obstacle to peace. Thanks to the leadership of the Personal Envoy and the active support of the Security Council, we now have a real window of opportunity to deliver a just, peaceful and lasting solution leading to a genuine process of self-determination in Western Sahara. The Security Council must build upon the current momentum through concrete action that ensures the inalienable right of our people to self-determination as called for by relevant Security Council and General Assembly resolutions. "If this process is to succeed, it is critical that Council members act in the interests of peace, and in support of international law, by taking steps that will maximise the chances of a negotiated solution between the Frente POLISARIO and Morocco. We urge members of the European Union, in particular, to rethink their approach to this issue and to support the UN Peace Process in Western Sahara by using trade as a positive incentive for a just and lasting peace agreement. "We will continue to do our part to support the political process and advance our people's inalienable right to self-determination and independence. For this process to remain credible in the eyes of our people, however, future rounds of peace talks must demonstrate concrete results. Key to progress will be the Council's support for an effective package of confidence building measures that includes release of Sahrawi detainees illegally held by Morocco, the presence of UN human rights monitors in the occupied territories, an end to Morocco's ongoing violations of the ceasefire and a stop to Morocco's illegal plundering of Sahrawi natural resources. "We thank His Excellency, Mr Horst Kӧhler, for his active commitment to advancing the political process towards a more focused and substantive phase of direct negotiations between the Frente POLISARIO and Morocco. We urge all Security Council members to redouble their efforts to support his efforts and to provide him with the resources and options needed to ensure Morocco engages fully and constructively in the peace negotiations. With the necessary political will, we are confident that a just, peaceful and lasting solution, leading to a process of self-determination in Western Sahara, is possible." Copyright © 2019 United Nations. All rights reserved. Distributed by AllAfrica Global Media (allAfrica.com). To contact the copyright holder directly for corrections — or for permission to republish or make other authorized use of this material, click here. Western Sahara: Western Sahara - "No One Even Knows If We're There or Not." Senegal: "Mankind is Like This - One Wants to Get Ahead"